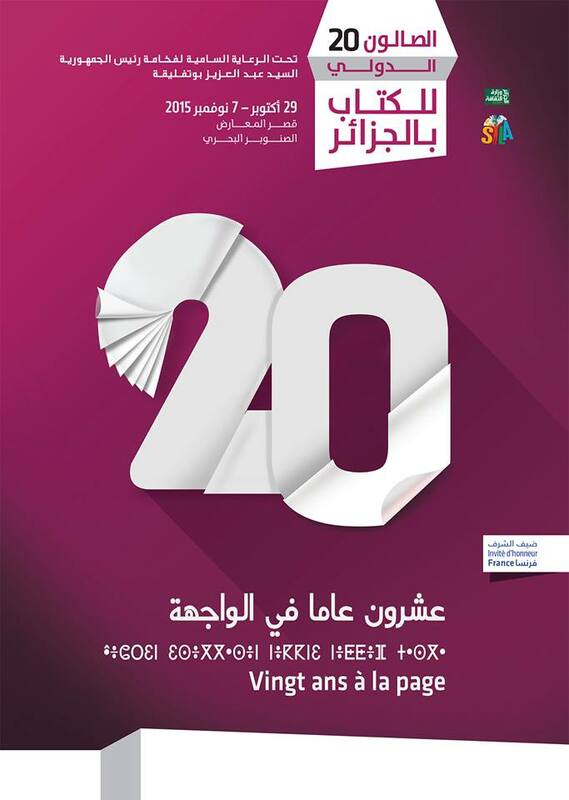 The 20th edition of Algiers’ International Book Fair is about to open its doors for a week between 29 October to 7 November. During a press conference held on 25 October to help publicise the event - and which was live-tweeted - #SILA2015’s Commissioner, M. Hamidou Messaoudi, communicated some important, and some strange, information on the event’s scope and structure. Here are some press conference highlights. The guest of honour this year is France, who is said to have invited a number of high flying speakers, and has organised a special series of activities to mark its very own special edition. 53 countries in all will participate to the event, and 25 thousand titles will be made available. Priority has been given to new releases we are told, and to university and scientific publications. The Commissioner highlighted that, this year, 54% of exhibitors are Algerians, possibly in comparison to a majority of foreigners in previous years or to comfort public opinion that this is an ‘Algerian owned’ event. The commissioner also added that foreign exhibitors have been limited to 200 copies per book – limited to importing and selling presumably. Algerian exhibitors are under no limitations or restrictions. 910 publishing houses will take part in this edition, 10% less than last year. The reduction is said to be due to a breach in regulations committed by previous participants. The rule possibly invoked as breached is that unsold books must be returned and declared within 48h. SILA 2015’s budget has been cut down by half because of austerity measures now implemented by the government in all areas, not just culture. These budget cuts will seriously hit the cultural scene from 2016. Cultural analyst Ammar Kessab discussed the impact of budget reductions in his recent analysis where he announces that the budget for culture has gone down from 437 million dollars in 2015 to 167 million dollars in 2016, a 63% collapse. Accessing SILA will remain free and open to all. The organisers had played with the idea of introducing an entry fee this year, but the sheer number of participants expected is too large to make this a manageable option. And that’s a good thing. Books are expensive enough as it is. A ‘special delegation’ will be dispatched to patrol book stands to check that no book incites to hatred or racism. No criteria for what might class as such has yet been announced. Another patrol will do its rounds to control that no theft is committed. The entire fair will further be put under custom control. The Assia Djebbar Prize for the best novel in French, Arabic or Tamazight will be given during a ceremony held on 4th November. No short or long list the jury might have selected has been communicated to the public yet. A space will be reserved for children, children literature hopefully, and not just amusement. No comic books will be present, FIBDA, the yearly Comic Books Festival in Algiers, is deemed sufficient enough to promote the genre. A special reference was made to the Panaf’ spirit for which a special area will be opened. No indication as to what this might mean has been given yet. It is also promised that literature in Tamazight has been given special thought and a special place. Tifinagh features prominently on SILA’s poster for once. With France as guest of honour, no doubt books in French will massively be made available, as is the case every year in fact. In a country where a majority naturally reads, writes and jokes in several languages, what space will literature in Arabic and Tamazight be given? SILA could be a wonderful place for literature in translation. From 53 languages into another 53 in theory at least. But in reality, in what langue will these 53 countries, Algeria among them, promote their literature? For 7 days, will the world be turned into a French translation? We’ll have to see won’t we! Follow SILA on twitter @SILAAlger with the hashtag #SILA2015, and on FB here.